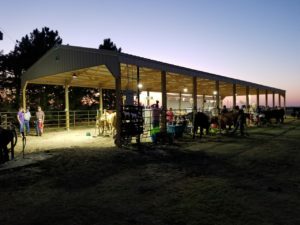 A new beef barn at the Gove County Fairgrounds provided more space for the animals and the exhibitors. The new barn is a big enough to allow for future growth in the 4-H program. Approximately 30 steers and heifers were under the barn for the fair this year and there was still room for more. The barn was built with a grant from the Hansen Foundation and the electricity was funded by the Gove County Fair Board.